At first glance, barge loading is simple enough – a barge pulls up, a chute lowers, and grain feeds into the barge’s hold. And it would be that simple if barges operated on land like their railcar counterparts. However, barges float on water and are constantly subject to the forces of river currents, wind and buoyancy. 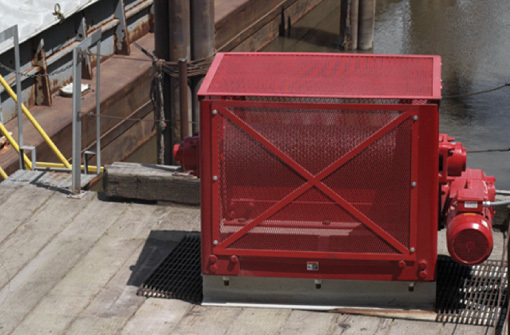 Thern has designed and built winch systems specially designed to assist with the positioning and loading of barges at grain terminals along America’s commercial shipping lanes. Barge control systems from Thern employ electric winches working in tandem to move the barges into position at a terminal securely. 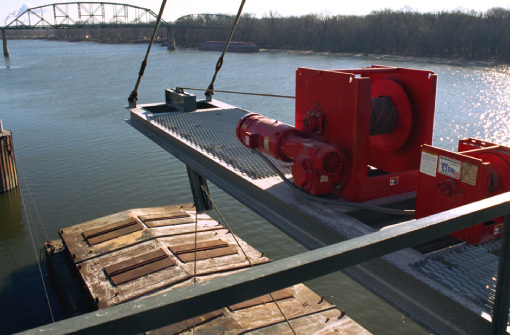 Simply put, the winch cables attach at either end of a barge (or group of barges), and as they move, one winch pays out tensioned cable while the other hauls in the cable. The movements are precise, but the system factors in barge drift due to current and wind to help mitigate stress on the system while still maintaining control. Operators control the system via a remote control station. Thern also builds winches designed to position chutes during loading. As barges fill, their orientation on the water shifts with the distribution of weight and they begin to ride lower in the water as their buoyancy changes. To prevent spills, operators must continuously adjust the chutes to match the position of the barge. Small electric winches, also remotely controlled, make the necessary adjustments continuously throughout the loading process.